On Wednesday, Governor Steve Beshear held a press conference to cheerfully announce that Kentucky will soon have the dubious distinction of being home to "Ark Encounters", the world's largest Christian Creationist theme park. Stranger still, it may be done with partial state funding. Is that legal? Not everyone is convinced that the arrangement doesn't violate Church-State separation issues. The Courier-Journal quoted Barry Lynn, executive director of Americans United for the Separation of Church and State, as saying he hasn't decided yet whether or not to sue. But they also quote prominent Kentucky atheist Edwin Kagin stating that he doesn’t think there's any grounds for a lawsuit. And though I usually don't come down on the same side as Kagin (I don't have much kind things to say about atheism in general), for once, I agree with him. The loophole by which the theme park qualifies for state funding is through tax incentives, and even legal scholars who hate Creationism are grudgingly agreeing that the arrangement is legit. Personally, I have no problem with the idea of the Ark Encounters park, even though I don't share their beliefs. Nowadays, religion seems to play a much smaller part in the average American's life, and the "separation of Church and State" routine is increasingly wielded as a kudgel against certain religions, and against the idea of religion itself. I say, let there be lavish theme parks for all religious beliefs, even obscure ones. Could be epic, if you think about it. The park is being brought to you by a for-profit group called Ark Encounters LLC and a non-profit group called Answers in Genesis, the folks who brought you Kentucky's Creation Museum. Regardless — it is all still advertising! We have met a number of people who have come to the Creation Museum out of sheer curiosity because of hearing things like this—and we praise the Lord that they come! At least they will hear the gospel clearly presented. And so I find myself in the odd position of supporting Mr. Ham and his enterprises, even though I disagree with the premise they're based on, and even though Mr. Ham himself doesn't seem to get that I'm actually trying to help him despite our differences. There are many religion-hating persons who seek to stop Creationists from spreading their message like this - I am not among them. Unlike arrogant atheists like Bill Maher, I wholeheartedly support what Mr. Ham is doing, even if I do find his Flintstones-esque message to be scientifically incorrect and scripturally unsound. Gov. Steve Beshear said he favors providing the tax incentives to encourage investors to move ahead with the Ark Encounter project that investors claim would create about 900 permanent jobs and have a $214 million economic impact in its first year of operation. The governor, who is seeking re-election next year, showed little patience with people who object to the project on religious grounds. "The people of Kentucky didn't elect me governor to debate religion," Beshear said. "They elected me governor to create jobs. That's what we're doing here, and that's what we're going to continue to do." I've long been a fan of Ken Ham, Answers in Genesis, and the Creation Museum...Not because I believe in this nonsense, but because I think it's hilarious. The world needs more crackpots to challenge the status quo. Crackpots are generally just cartoonish exaggerations of what others think. 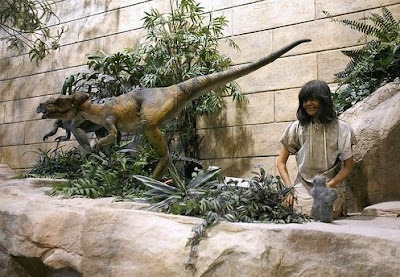 Ken Ham and these kinds of museums perfectly represent the nutty positions these people hold. This kind of comedy is hard to come by, so I fully support it. SELAH! :) And Ark Encounter? Bring it!!! With fond remembrance of the Catholic nun who discouraged me from reading a better-translated Bible on my own [Literally: "Don't read the Bible; that's what we're here for, to tell you what it says. "], I find some hope in the knowledge the Ark Encounter will cause a few folk to run, headlong, into why Noah and his family were chosen (their 'lines were pure'), and the stated purpose for the flood (to undo the interbreeding of Angels and Humans in Genesis 6. Seriously, its all there, if you haven't read it). Literalists are in for a shock, but I believe it will be good for them in the long-run. However, I still have yet to hear anyone adequately rectify the concept of Biblical inerrancy (one of Mr. Ham's primary tenets) with the fact that these texts were written in languages extremely different from English. Maybe success in our fair, but wonderfully weird, Commonwealth will get somebody on that task. An ABC World News report I saw about the park stated they are also planning to have a Tower of Babel. We are soooo there, Dudes! I really need to move out of Dry Ridge before the theme park is built! I just don't want the hassle of having any kind of theme park in my county of residence! Louisville Judge Advocates "Prison Justice"